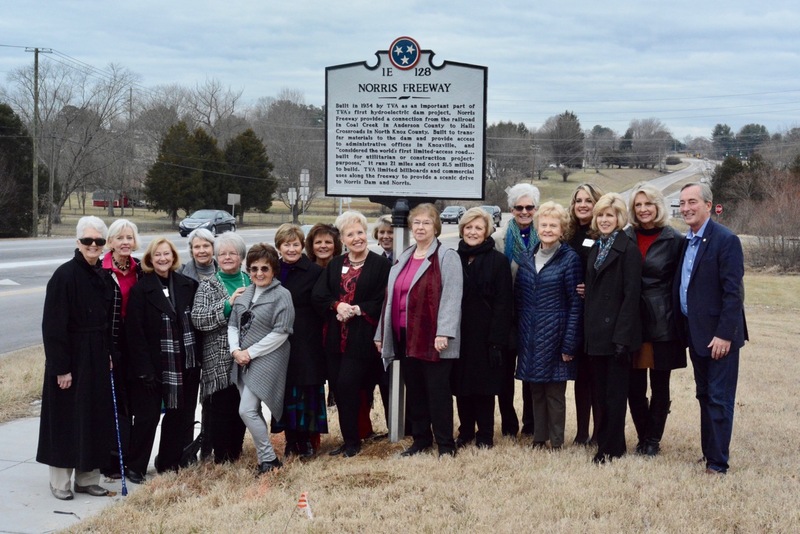 The Halls Crossroads Women’s League gathered beside Norris Freeway in Halls Jan. 20, to unveil a roadside plaque commemorating the thoroughfare and its significance in Tennessee history. 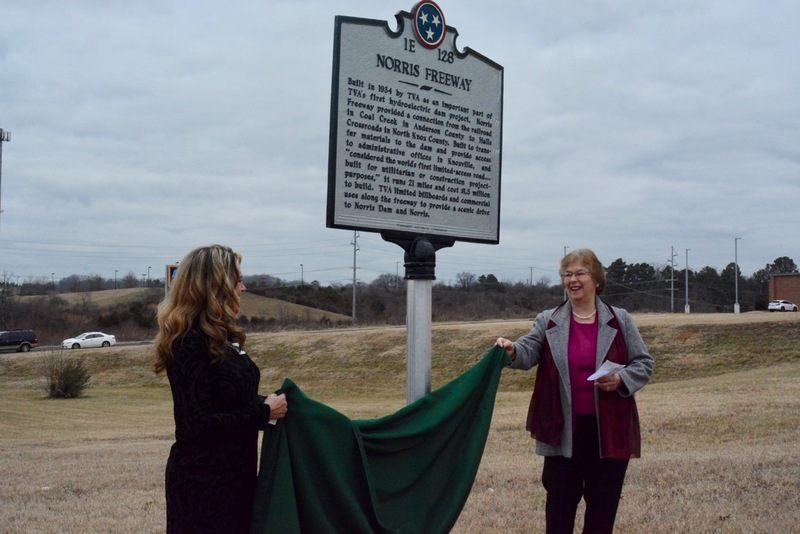 The League’s preservation committee petitioned the state of Tennessee for the marker and provided $1,400 to have it placed. 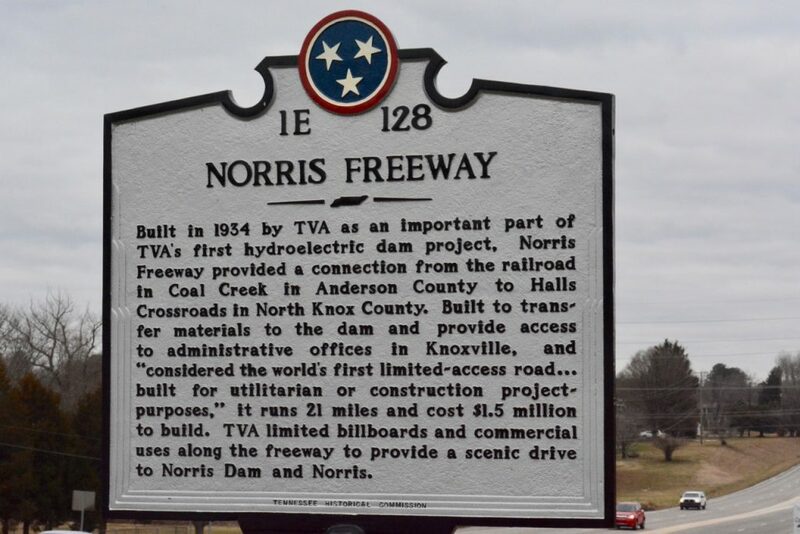 Built in 1934* by TVA as a component of a hydroelectric project, Norris Dam; Norris Freeway provided a connection from the railroad in Coal Creek in Anderson County to Halls Crossroads in North Knox County. Built to transfer materials to the dam and provide access to administrative offices in Knoxville; “…considered the world’s first limited-access road…built for utilitarian or construction project-purposes;” ** it runs 21 miles and cost $1.5 million. TVA limited billboards and commercial use providing a scenic drive to Norris Dam and Norris. This roadside plaque notes the historic significance of Norris Freeway in Halls. *Carver, Martha, “Norris Freeway,” Tennessee Department of Transportation, Tennessee Encyclopedia of History and Culture Version 2.0. **Van West, Carroll, Tennessee’s New Deal Landscape/A Guide Book, 2001, The University of Tennessee Press/Knoxville, pg 223. Doris Smith, a self-described “history buff,” was the driving force behind the marker, researching the road’s history and organizing the League’s effort. The Halls Crossroads Women’s League is joined by Knox County Commissioner Bob Thomas (right) for the unveiling of a new historic marker for Norris Freeway.